Here is how I used art, dance, writing and other creative and self-expression methods to transform and heal my own life. I believe everyone should take the time to awaken their creativity and self-expression. They are powerful tools of healing and transformation. Here you will find many tools and suggestions you can use to heal and transform your life. So much can get in the way of freely expressing ourselves. How come some people can easily write, sing, dance, paint and play an instrument, and others don’t believe they can? First of all, everyone can! Yet, some people have it in their minds that they can’t. Some people know they can but feel all caught up in fear and self-judgment. Others have simply resigned themselves and say they can’t. Yet EVERYONE has it in them to create and express themselves freely. My psychotherapy and coaching work is all about freeing people, including their creativity and self-expression. Nothing is more frustrating than feeling creatively blocked. Or simply feeling we can not express ourselves. Some of us had times we simply didn’t feel we could even talk right, or say anything without feeling terrible or stupid. I know, I used to feel this way for years. If any of this pertains to you, seek help in clearing these blocks so you can connect to your power, self-love and self-confidence. Find a counselor that understands how to clear these blocks and trauma, and who will also encourage and help you access and free your creativity and self-expression. Find someone you are comfortable with whom you really feel understands you and this subject thoroughly. Creativity is part of everything. Whether you are building a business, decorating a home, writing a book, giving a presentation, creating artwork, painting, dancing, singing, sculpting or playing music, connecting to and freeing your self-expression is key. 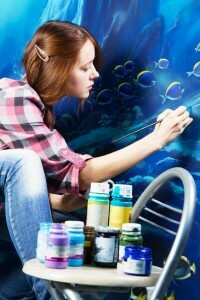 Having a creative outlet or two in your life will play a major role in your healing, joy and success. Make it a priority to free your heart and soul! One of the most helpful practices is writing in a journal every morning upon waking, as well as before bed. I have been doing this my whole life with great benefit. Write freely whatever comes to your mind, write down your dreams or dream fragments, write your goals and intentions, write about yourself and life, creative ideas, memories, feelings; write a poem, brainstorm, make up stories, let your imagination run wild. Be sure to write down all the things you are grateful for. Gratitude is the most powerful prayer in the world. One of the most valuable things I know is to reflect on our lives, expressing our thoughts and feelings through writing. Writing frees creativity and self-expression. More suggestions: Write letters to people you once knew, family members, a lover, a partner or child you dream to have in the future, write a letter to God, often. Journal writing has nothing to do with writing skill or talent. We are not competing with Shakespeare! We are giving freedom for our heart and soul to come through, to be seen and heard. I suggest using a pen, or pencil and paper. It has been proven that something unique takes place between hand, mind and eye coordination that supports and enhances this type of writing rather than typing into a device. Though if a keyboard is all you have or want to use, by all means use it. Further enhance your journaling by playing around making mind maps, and adding visuals and scribbles to express your ideas, thoughts and feelings. There is a whole other power and benefit in this towards awakening your creativity. Add color, allow your creativity and imagination to soar. 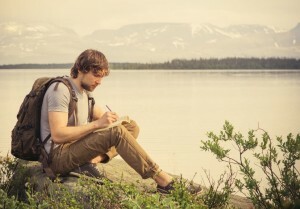 Take your journal along wherever you go, ready to jot down ideas, inspirations, memories and other useful information. I found it very helpful over the years when seeing a therapist or coach, to journal before and afterwards. It made a real difference in the results I received from my sessions. I also always meditate before such sessions. I pray too. I see the therapist at his or her best, and the connection between us yielding to transformative and meaningful results. I ask that God/Spirit be present and guide the session for our highest good. I do the same before seeing my own clients. This preparation and opening to all dimensions of the process plays a major part in the sessions going well and being truly productive. Art was my early pathway into healing my life. At a time I did not have words anymore, when I was too emotionally wounded to relate to the world, not yet open to therapy, art provided me a way to begin processing the stuck emotions in my body and begin reconnecting to myself. From the time I began creating artwork at nineteen years old, art was a very valuable path of transformation for me. I approached it that way. I did not set out to make art. I was not interested in making any political statements or commenting on culture. I was not interested to paint in any certain style or learning all about art. I was not even interested in making anything beautiful or worth hanging on the wall. I was only interested in one thing, the same thing I was interested in when I journaled, when I meditated, when I made changes to my diet, when I read books – I was, and I still am, predominately interested in self-growth, self-discovery; in personal and spiritual connection and transformation. From the very beginning I observed very closely my rhythms, the rhythm of my breathing, the movement of my hand and body. I watched my thoughts and sensed my inner being. I was constantly experimenting. Everything about drawing and painting was an experiment to me. I had little interest in learning how to create certain colors, composition or design. I had faith that by touching into the natural truth of my own being, being part of this Universe and nature, all of that would come through naturally. My intent was on freeing myself to let go, to learn to play again, to create and to allow my whole self and soul to be fully in the creation, fully expressed through my body. To assist my intention I meditated before and often during painting. I would pay very close attention to my breath and find a rhythm to paint from connected to my breathing. I would do things like switch hands, even painting with brushes in both hands at the same time. I painted with my eyes closed, while humming, while talking out loud, while having conversations with different parts of myself and even with my painting. I often tried painting to the vibrations within me, to the inner music, to the music of the Universe we can hear when we are still enough to listen to it. I also experimented painting to different types of music, classical without words being my favorite. In those years, some of my favorites were Beethoven, Chopin, Mozart and Debussy. Painting like all true creation and living, is the art of allowing creativity to flow from a place of deep listening. Besides music, nature was my main source of inspiration. Even though my paintings were very abstract, nature and music are what people saw in my paintings, bodies and faces too. The energies and vibrations of nature delighted me, so no wonder my paintings were of nature. There never were actual trees, bubbling streams, wind or human forms consciously being painted, though their movement, energy, endless variation of lines and forms subconsciously found their way into my work. Looking back, it is clear to me that my years creating art work transformed me and was a path of spiritual and personal growth. My main intent was always to deepen my connection to God. I was always searching to tune into that which is sacred in all of life and nature. I wanted to marry spirit and matter in my life and artwork. My art work led me to my greater passion, which is my passion to help others transform their lives, to be directly involved in their own processes of transformation. At the time this desire to be a counselor and healer awakened in me, I mistakenly thought I had to choose between being an artist and being a healer. I was stuck in black and white, either-or thinking back then. I wish I had continued doing more artwork than I have. My counseling and healing practice took over my life. Recently though, I have begun to paint and write more often again. My daughter who loves to paint is also inspiring me to return to painting. Seeing her natural process, watching her at times simply go to our art closet, take out the art supplies, set up and spontaneously disappear into her creation of a new painting absolutely delights me. It is a magical process. I watch how it integrates her energy, calms and centers her whole being. I see it as instrumental to the growth and well-being of her life. What an amazing gift passed onto me from my mother, and from Richard Pousette-Dart my mentor, and now passed onto my daughter. From nineteen years old, all through my twenties, and later through some years of major trauma and recovery in my forties, through those times of tremendous growth, awakening, transition, trauma and transformation, art served to heal and integrate me. There were times I was so entangled, so stuck, so confused, on the verge of exploding or imploding with emotions and feelings I could not articulate or process. I would take my drawing book and color pencils, oil pastels, or often only crayons, and within minutes I was in a healing zone. The very act of free-form, spontaneous creation soothed, integrated, and put me back into a healthy alignment again. Doctors should be writing prescriptions for artwork, not handing out pills that often only serve to control and further suppress people’s emotional pain. A wise doctor will bring forth his patients inner expression and healing through music, voice, color, art, writing and dance. The way our culture devalues and suppresses the artist, which is within everyone’s truest nature, without doubt contributes to disease and unhappiness. We are all dancers, musicians and artists at heart. We are all made in the image and likeness of God the Creator. Two of my most highly recommended ‘therapies’ are writing and art work. This does not mean everyone needs to write a book or paint paintings. By writing and art I am including every form of creation known and yet to be invented, including journaling, singing, playing an instrument, sculpture, weaving, dancing, singing, drawing, coloring, painting, woodworking, or building models of futuristic zero-energy-waste homes. The sky is the limit of your imagination. Be certain to have something in your life that involves pure play, pure intuitive creation, something that gives full freedom to your imagination. For this activity there should not be an end product, success, or sale in mind. This is for pure healing and transformation, pure joy and discovery. This is art to meet, communicate, get to know, to become consciously connected to your own heart and soul; to intimately get to know your whole being. Art heals. Creating is healing and puts us in touch with our heart and inner being. Think of it more as play than art. Allow your intuition and subconscious to come forth. Just have fun and see what emerges. Try different mediums such as colored pencils, oil pastels, watercolors, acrylic paints and collage. Find that place just between your conscious mind and subconscious mind, going back and forth between the two. Spend a moment reflecting on what has emerged. It is kind of like reflecting on a dream. This kind of artwork can be highly transformational. People have found it to be very beneficial towards releasing pain, trauma, emotional blocks and illnesses, as well as promoting personal and spiritual development. Pure art, fully involving yourself in the moment of creation, has the power of ending the separation of Spirit and the person creating. Art, can, like all healing, take God back out of the sky or heaven on some distant day and connect us back to the present; art connects us back to our hearts and our Living Spirit. Through our heArt we can rediscover that heaven is right here within and all around us. In that which we appreciate and create as meaningful, we find God, the Infinite Source of all life. Art, meditation, making music, if only with the sound of your voice or homemade instruments, writing from your heart, they all lead to the same place. I suggest that all have a place in everyone’s lives. Creativity and self-expression should be priorities in all our schools, not just offered as electives. Art, music, dance, writing, improvisation and other forms of experiential expression should all be mandatory. Actually, for many, math can more easily be learned through art, music and dance, rather than just out of a book, sitting at a desk. I want to emphasize how beneficial and important it is to do something creative with our hands. It is highly beneficial for growth and development in children, and it is very healing for adults and elderly people as well. 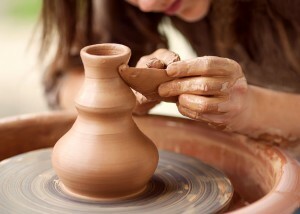 Creating with our hands centers and calms the brain-body-mind, it reconnects us to our wholeness and peace of mind. It is great for getting people out of their overactive mental minds and bringing them back into the much needed present moment. Personal self-expression is key to success in life and should be a key focus in school. Did you leave your music, art, dance, writing behind? Why? It is never too late to engage your heart and soul again. Music is a phenomenal healer that can sooth and balance the body and mind. We are now blessed with access to music from all over the world and history through the internet. We can search and experience all kinds of music to nurture and balance our minds, nerves and soul, enhance our brain and promote healing. Did you once play an instrument and put it down? 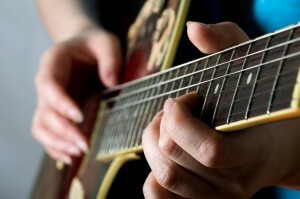 Have you been inspired to play music, though never tried? Maybe now is the time to act on it? Stop comparing yourself to others or thinking it will be too difficult. Just try it. It may bring great joy into your life like you never imagined. It may also build your brain and create neural pathways that will serve you in many other areas. Stop putting off inspirations and dreams, act now! In almost everyone I notice tension and constriction in the throat chakra and down into the chest. There always was a lot of tension in this area of my body as well. It can be relieved and our energy freed up by allowing ourselves to work and play with sound. Try experimenting with different types of voice work, including toning, sounding and singing. Allow yourself to make weird and funny sounds whenever you can. Make crazy contorted faces. Talk out loud really slow and exaggerate what you are saying. Try sitting and just toning. You can use the vowel sounds and musical scales. Play with different pitches, effects, tones. 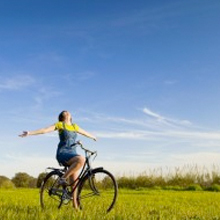 You can free and have far greater access to your energy through freeing your voice. It is a great way to awaken your feelings and life force. I have taken a number of different kinds of voice classes throughout my life. Sometimes I have taken private lessons and other times group classes. The intention for me was not to become a great singer, I’m not. It has always been to transform and open up my energy, to free my voice, creativity and self-expression. It is all about transformation, healing and growth. I highly recommend this type of voice work to everyone. Many people fear public speaking and giving presentations, or feel anxiety when speaking to people in all kinds of situations. I help my clients overcome this, so they can feel confident and comfortable when the attention is on them. Freeing my own voice through voice work, speaking classes, HeartSpeak circles, private therapy and coaching was an important part of freeing myself from social anxiety, PTSD, and fears around public speaking and self-expression. Today, I really enjoy working with people to free their self-expression and teaching them to speak freely from their hearts. Whether you need support in speaking up to your partner or family members, or need to improve your speaking skills for work or giving presentations, I will make it easy and fun for you to become a very effective speaker. I highly suggest exploring different forms of dance and movement. Something special happens when dancing, you just feel good afterwards. There is free style dancing alone or with others, group dancing, line dancing, and partner dancing. Many people come to love some form of partner dancing. I fell in love with Argentine Tango. Everyone finds their own favorite. Dancing with a partner can be highly meditative, pure joy, a joining of hearts. Dancing is also one of the greatest exercises and anti-aging activities. Research studies have shown that dance has a very significant positive affect on people’s physical and emotional well-being. Research shows that dancing can relieve stress and depression even greater than meditation. Partner dance encourages a person to be highly engaged in the present moment. Another favorite dance of mine is Contact Improvisation. It does not take a lot to begin, though you will be constantly learning and growing as you dance CI (contact improv). It is one of the most amazing and magnificent human activities I have ever witnessed and participated in. It is truly wonderful. You need to experience it to understand. Think of it as pure freedom, pure loving play, pure creativity with other human beings. It is the closest thing I know to adults being pure as children playing. Contact improvisational dance can be truly life changing and powerfully transformational. It is also great fun, very intimate at times, surprising, and surprisingly profound. There are many types of dance movement and exercise classes. Just check your local recreation center or YMCA. I also love Authentic Movement, which is similar to CI, though more process orientated. In the least, everyone should become comfortable simply moving spontaneously to different kinds of music. Dancing is a great way to free your body, creativity and self-expression, and learn to enjoy playing again. Search under ‘ecstatic dance’ to find a place near you. If you can’t find a place, get together with some friends and dance in your living room or basement! I have taught people to dance basic Argentine Tango. And I love teaching people to free their bodies and to free up their dance and movement through dance. Want to dance? Begin now! A major component of illness, emotional and mental health conditions often involve a disconnection between mind and body. Body-centered, somatic therapies, dance and dance movement, and some forms of body-work can play a very important role in healing the separation between mind and body that causes so much stress, illness and unhappiness. Connecting the voice and breath with the body are also of great importance. Over the years, I have studied and practiced many forms of body-centered and somatic methods of healing. Often when I have felt stuck, upset, indecisive or just wanting to feel more joy, I get up and begin to move – with or without music. I like to add sounds as well, speak out loud, pray out loud and make affirmations. Combining movement and voice, movement and speech, movement and prayer, positive self-talk and affirmations is a very powerful combination to attract the change you want in your life. I recommend working with body-centered, somatic oriented therapists and coaches that specialize in dance movement, voice work, art, creativity and self-expression. When it comes to healing emotional, mental or physical issues, don’t be afraid to think outside the box, think creatively! There are many effective psychotherapy methods, alternative healing and creative art practices worth exploring. Are you ready to free your heart, creativity and self-expression? Have you been procrastinating? Do you desire support? I can help you learn new ways to unleash your creativity, free your creativity and self-expression, along with your life. Whether you could use a coach and mentor, or whether there are some deeper issues holding you back and you are looking for a psychotherapist, I can work in multiple ways to help you. Visit my Contact Page and find out your options to connect with me. Are you feeling stuck or unfulfilled? Individual therapy can help tremendously. Click here to learn more about how I can help you. I offer a unique coaching style, click here to learn more about it.